Since the fall of northern Mali to the forces of the Tuareg at the end of March 2012, the situation has grown in complexity. The group of young officers, more or less led by Captain Amadou Sanogo, had taken control of the government buildings of the Central Government in Bamako on March 23, but they had little idea of what else to do. There was an immediate counter-reaction on the part of Western States such as France and the USA who provide most of the financial and technical assistance to Mali. Both France and the USA cut their aid to Mali—a country currently facing a severe drought and food shortages. Likewise, the 15 states of the Economic Organization of West African States (ECOWAS) called for a speedy return to the civilian government. Captain Sanogo saw the “handwriting on the wall” and agreed to turn over the government to the President of the National Assembly who is the constitutional replacement when the President is absent. In the meantime, the country is divided into two roughly equal areas—a north with the Tuareg holding the two major cities of Timbuktu and Gao, and the more populated south whose population provides most of the civil service, the army and the agricultural wealth of the country. 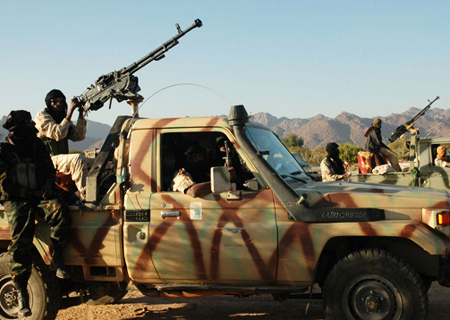 The Tuareg along with various armed groups probably from Mauritania, south Algeria and fighters who had been recruited for Libya are divided on what strategy to follow. There are two broad options. The largest group, Mouvement national de libération de l’Azawad (MNLA) wants an independent state of northern Mali (and probably part of the Tuareg-inhabited Niger) to be called Azawad. The second faction, called Ansar Dine, is smaller but is more heavily armed and contains the bulk of armed foreigners. Their stated aim is to take control of all of Mali and to install Islamic law. Both options have difficulties. Northern Mali as an independent state of Azawad has no natural resources, a small population and few educated people to administer a state or to develop any economy beyond that of camel nomadism. In addition, most African states are opposed to carving up existing states or changing frontiers—a Pandora’s box as many states could be redrawn on ethnic lines and frontiers changed. Thus “territorial integrity” is an article of faith. Ansar Dine’s option of an Islamist Mali is also difficult to realize. The Bambara and the Malinké are the largest groups in the country and hold economic, military, and political power. Ideologically, they are opposed to the Islamic vision of Ansar Dine, being more Sufi-influenced with a large measure of traditional African beliefs and practices mixed in. (1) Thus the possibility of Ansar Dine gaining support in the south of Mali is slight. However, they may be able with force of arms to impose their views on Timbuktu and Gao but not on the northern countryside. The Tuareg are not Islamist by tradition. Yet in the two cities, the Ansar Dine may be able to force women to cover their hair, prevent the sale of wine and cut the hands of robbers—these three practices being the extent of their knowledge of Islamic law. Faced with the difficulties of having a northern Malian state—Azawad—accepted by the power-holders of Mali and the neighboring states, there have been some discussions among Tuareg leaders and a former Malian government leader in Nouahchott, Mauritania. There have been no official statements coming from these talks, in part because both north and south Mali are in administrative disorder. No one knows how much authority the persons involved have. For the moment, it is probably at best “Track II” diplomacy, trying to see what are the aspirations, the limits of the acceptable, and the degree of the willingness to compromise. In the past France and Algeria have mediated disputes between the Tuareg and the central government of Mali. There have been past agreements on autonomy for the Tuareg. However, these agreements have rarely held and more centralized government was slowly restored. I believe that this is due more to the incapacity of the Tuareg to provide trained people to run a decentralized administration than ill will or a desire of control on the part of the central government. Echoes from the current Nouachott talks have spoken of a “Federation of Mali”. The name has already been used. The Mali Federation with Senegal was achieved briefly on the eve of independence and lasted for 506 days from April 1, 1959 until August 19, 1960 when it fell apart during the conflict between the President of Senegal, L. S. Senghor and his Prime Minister Mamadou Dia, largely over the division of authority between the two posts. Rene Wadlow is the President and Chief Representative to the United Nations, Geneva of the Association of World Citizens.